Towards the end of the 2015 Feng Shui & Astrology Seminar in KL, Joey Yap revealed a list of date and time to activate wealth, health, relationship and more. I am going to post the entire list here so you may want to bookmark this page. Have not read Part 1 yet? Read it HERE. But first, how do you go about doing the activation? Well, you can choose to move the furnitures around, nail the wall to hang a picture, or place a water element. According to Joey Yap, the water must be at least 3 feet wide and 2 feet deep to be effective. It should not be covered and it does not have to be running water. Also, the water need to be displayed for only 2-3 weeks, not longer than that. Also the time stated here is the local time in whichever country you are living in. There is no need to convert the time if you are not staying in Malaysia. There is a 2 hour window to activate the sectors. If the time stated is 1.30pm, you can actually do your activation anytime between 1pm and 3pm. Joey Yap has given the time 1.30pm to be safe so that it is not too near to 1pm or 3pm. Similarly, if the time stated is 9.30am, that means you can do the activation between 9am and 11am. If you don't understand what I mean, don't worry - just stick to the given time punctually and you shall do fine. *Note : Clash means if you have that animal sign in your Bazi Chart, then that particular date is not beneficial to you. Choose another date instead. You can choose just one date to activate or you can activate on all the three dates as long as none of the animal signs clashes with you. *Note : The first date 11th April 2015 is especially good for surgery. *Note : The Clash here refers to the animal sign NOT in your Bazi Chart but in the other person's Bazi Chart. To activate, you need to face the direction given and your intended target face the opposite direction. For example, to activate on 12th March 2015, you need to face South while your intended target face you ie. North. And he or she must not have a Snake in his or her Bazi Chart. So make sure you check his or her Bazi Chart beforehand! *Note : This Academic Activation is not only for studying, it can also be used for writing a proposal, coming up with a new idea, or writing a book. Also the first date (9th March 2015) is better than the second date (12th March 2015), so choose the first one unless you have Tiger in your Bazi Chart. *Note : If you are always losing the argument with someone, then maybe you should pick this day and time to win! Make sure you plan it in such a way that the other person is sitting South East and facing North West. Just a note of interest - If you have learnt about Qi Men Dun Jia before, the other person is actually sitting at the Death Door, as such he or she is likely to lose the argument! *Note : Only search for property AFTER you have done the activation. *Note : I really don't know who will use this but if you do, then just for your information, this is especially potent because you, the Interrogater will be sitting at Harm Door while the other person who is being interrogated will be sitting at Fear Door! Those of you who have learnt Qi Men Dun Jia will know what Harm Door and Fear Door means! *Note : Before making your wishes at this date and time, it's advisable to write down your wish list first. However, too many wishes are not as effective as just one important wish, so choose what you wish for wisely. I am quite surprised that Joey Yap did not provide dates of activation for Resolving Problems and Spiritual Development like in previous years. He also did not provide the time and direction to activate God Of Wealth on the first day of Chinese New Year. Oh well, maybe I will have to look at the Qi Men chart and try to find the good direction myself! This is the date and time of a solar eclipse, which is deemed very inauspicious in both chinese and western astrology. Even though Malaysia will experience only a partial eclipse, the effect of being exposed to the eclipse will be just as bad. Joey Yap said being exposed to the eclipse for 1 minute is equivalent to 1 year of bad luck, 2 minutes equals to 2 years of bad luck and so on. Better not take chances and stay indoors till the eclipse is over! *Note : If really no choice and you absolutely must do something important on this day and time, then at least choose the good direction with Life Door. (For those who knows about Qi Men Dun Jia, refer to the Qi Men chart at that particular time for the direction of Life Door). Lastly, this is for those who plan to find the best date to start work after the Chinese New Year holidays. Especially important to business owners, not so important to those who are working for others. *Note : Joey Yap mentioned that out of the five choices, the best day will be the first one i.e. 23rd February 2015. Second best is the last one i.e. 1st March 2015 which by the way is a Sunday. If you don't work on a Sunday, maybe you should pretend to work on that day! LOL. **Special Note : To make use of the dates given in this post, it is best to make a donation to the charity of your choice. Joey Yap did not mention this because I think all who received this information at the seminar already paid for the seminar tickets (unless you got free seats). For the rest of you who did not attend the seminar but receive this information from this blog post, please make a donation before you use these dates. Thank you! 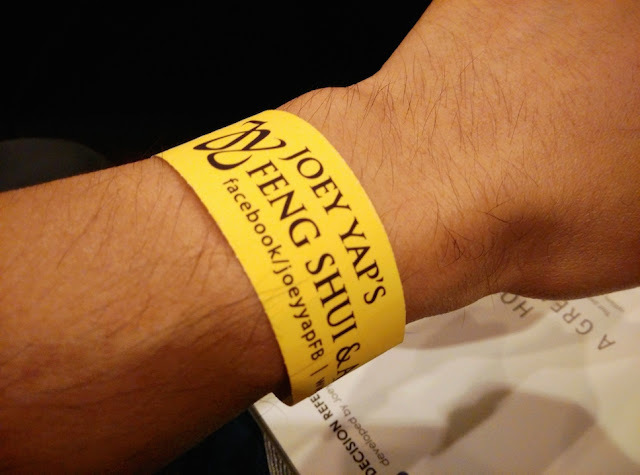 This ends my posts on Joey Yap's Feng Shui & Astrology Seminar 2015. I hope you find the information useful. Or at least you had fun reading. Haha! 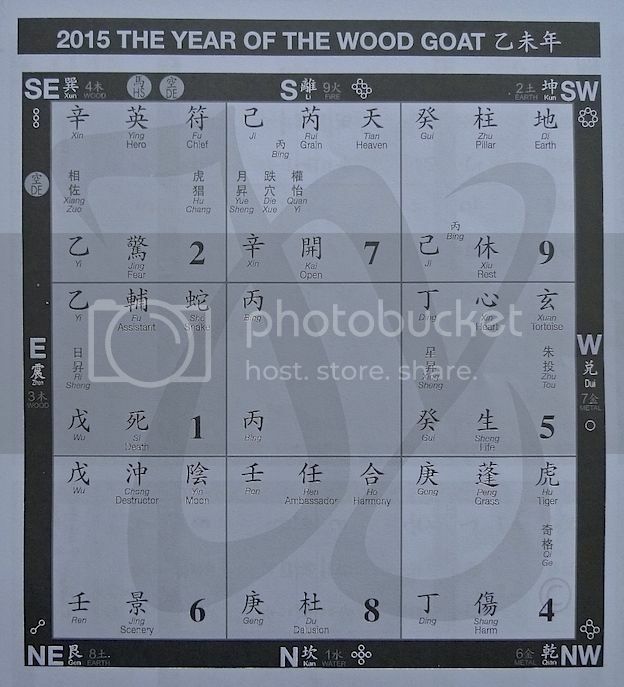 Here's wishing everyone a Happy Year of the Wood Goat! This is the Flying Star Chart for 2015. 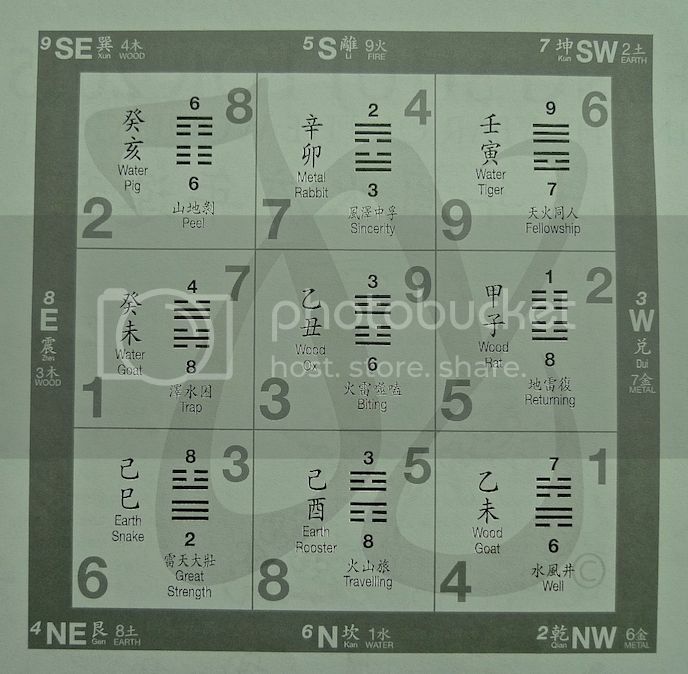 Taken from Joey Yap's seminar booklet, it is more detailed unlike the more simplified flying star chart you normally see which only show one number in each grid. Anyway those same numbers are also in this Flying Star Chart on the bottom left of each grid. From the chart you can see that the Star of Wealth #8 is at the North. If your main door or window is at this location, then you will enjoy wealth luck in 2015. Just using this door daily is enough to activate the wealth luck. If your front door is not at this location, all is not lost - simply use the North sector of your house more often will activate the wealth luck too. What happens if your North sector is your toilet or bathroom? Joey Yap said in such a case, use your toilet or bathroom more often. He said it's a myth that flushing the toilet is equivalent to flushing all your wealth down the drain. The Simplified Flying Star Chart (box in the middle) with only one number in each grid. Notice the numbers are the same as the numbers on the bottom left of each grid in the more detailed chart above? If you are unable to use North sector for whatever reason, the next best sector for wealth is the South West. (Star #9). With the Fellowship hexagram, this sector is good for investment especially when done in a team. Joey Yap suggested to do your investment in the South West sector of your home. The East sector (Star #1) is the Nobleman sector. The Trap hexagram creates an environment to hold on to customers so this sector is very good for business owners. Those with rabbit, goat or pig in their Personal Bazi Chart will be most beneficial in using this sector. North West (Star #4) is a good sector for education. The Well hexagram which only appears in 2015, is excellent for education. The 4-6 combination makes this a good memory sector. Not only is the North West excellent for children studying for exams, it is also good for adults who are learning new things. Want to learn feng shui? Then make sure you study it at the North West! North East (Star #6) with the Great Strength hexagram is good for executing ideas. If you want brilliant ideas to come forth and to make things happen, use North East in 2015! In fact, anything creative (like writing a book) will be best done in a room at the North East. Hmm, maybe I should put my piano in this sector so that I can compose more beautiful music in 2015. LOL! The South East (Star #2) is where the Illness star flies in this year. Sleeping here will make you more prone to getting sick. If you remember the 2015 Bazi Chart discussed in Part 1, the Water element is weak. As such, health problem this year will most likely be related to water element, which may mean kidney problems. Concerning health, Joey Yap touched on 3 ways to check on illness. First, check the ear - if the colour of the ear is darker complexion compared to the face, then kidney problem is a possibility. Second, check the nose - If the nose has blemishes, this might be related to digestive problem. Thirdly, check the lips - if the lips turn darker than normal, this shows circulation problem. If you have none of these 3 symptoms, then it's OK to use South East. South East sector is also a sector used for reboot. The Peel hexagram also means starting over or reboot. If your career or life reach a plateau, then it is advisable to use South East sector to sleep or work. South (Star #7) is the robbery sector this year. It also has the Sincerity hexagram which is indication of Peach Blossom. If you have Rat in your Personal Bazi Chart, then you already have Peach Blossom and there is no need to sleep in the South. However, Peach Blossom is not just for romantic love, it is also for relationship in your social circle. By utilising South more, you can increase your likeability factor which is crucial when dealing with others. As mentioned in Part 1, the West sector has the Five Yellow (this is shown by the Star #5) and also the Three Killings. If you cannot move out of the West room, then you can use the solution mentioned in Part 1 which is to activate the four auspicious stars at North East 3, South East 1, South West 3 and North West 1. 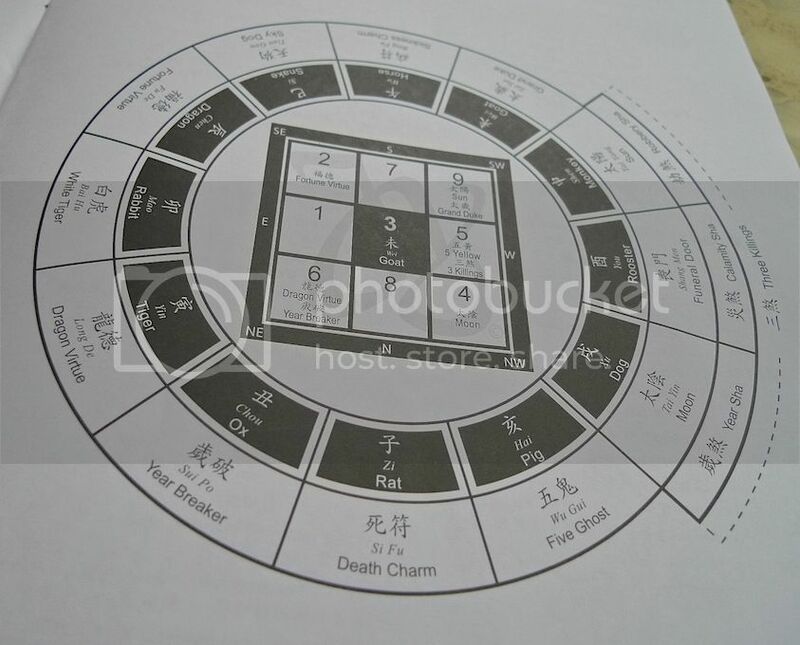 Alternatively, you can also activate the three auspicious sectors based on the Flying Star Chart which is North (Star #8), South West (Star #9) and East (Star #1). But make sure you do this before February 4, 2015 when the energy officially changes. The centre has Star #3 and the Biting hexagram this year. This is the argument star so expect lots of arguments to happen in 2015. This being in the centre means it will affect the whole household. However, Joey Yap said the centre is also a good sector for reproduction. Those of you looking to have a baby this year may want to consider using the centre but if you do not have a private room in the centre of your house then consider a room in the South West instead. Do not use South East (Star #2) for this purpose as it has the Peel hexagram which also means 'elimination'. 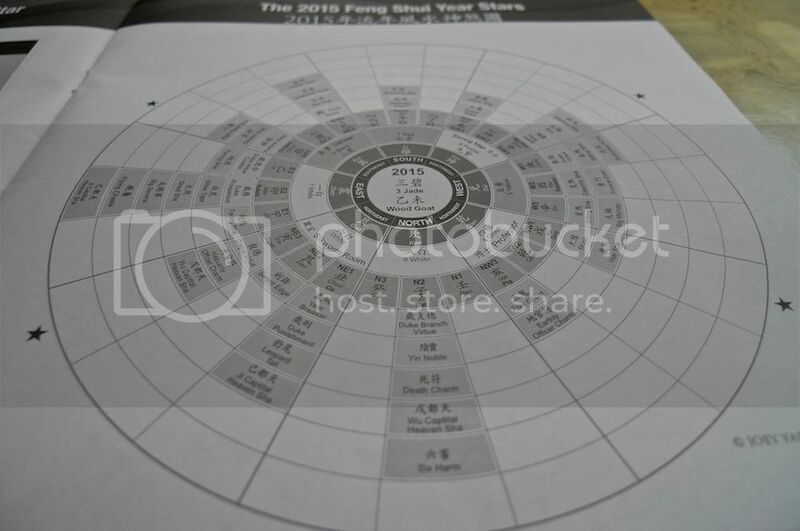 The Flying Star Chart can also be used to study the luck of different countries in the world. Joey Yap mentioned that since the West sector has the Five Yellow and Three Killings this year, Western countries will suffer from many conflicts this year. Using the same logic, I decided to make my own analysis from the Flying Star Chart. Since the #3 Argument Star is in the centre, does it mean that Central Asia and Middle East will suffer from more argument and battles? I really hope not! And since my country Malaysia is in South East, will the countries in this region suffer from the #2 Illness Star - possible more diseases and epidemics like the bird flu? Oh no!! Joey Yap also touched a little on Face Reading. How to know if a person has good fortune? First look at his eyes. They should be sharp and alert. 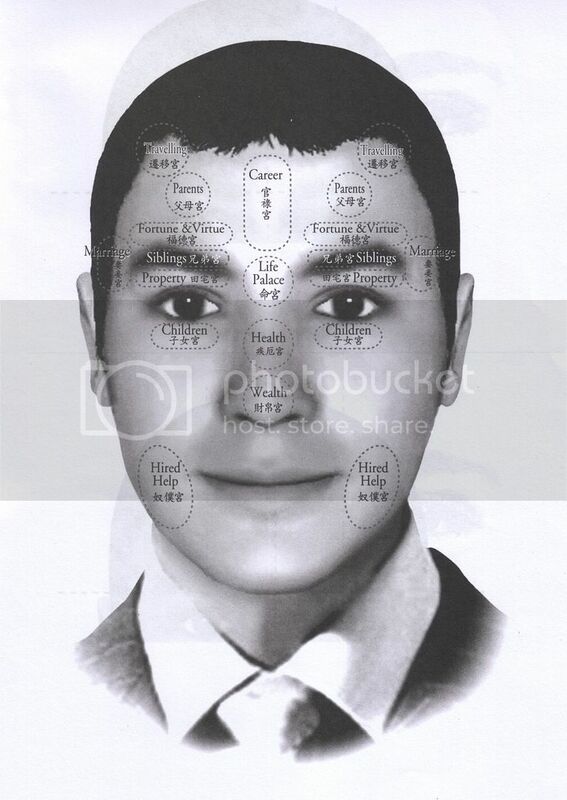 Secondly, you should be able to fit in 2 fingers on his Life Palace (the space between the eyebrows). The life palace should also be fleshy and bright. Lines or dark patches or a mole on the life palace would indicate not so favourable fortune. Thirdly, his Career Palace (the forehead) should should be bright and be able to fit in 5 fingers (for male) or 4 fingers (for female). Talking about moles, Joey Yap mentioned that moles only act as indication of your luck. Removing the moles will not change your luck as it is not the mole that is causing your bad luck. Joey Yap also shared with us Face Reading on the subject of infidelity. If the person has watery eyes or marble-like eyes, then he or she is likely to be having a love affair. Also, observe the lines at the side of the eyes. If the lines are long and extended till the Spouse Palace, that means the spouse already knew about the affair. During the second half of the seminar, Joey Yap talked about Qi Men Dun Jia, another branch of Chinese metaphysics. There are two types of QMDJ methods - one is San Yuan method which is based on sitting position. I have blogged about this method last year so I will not repeat here. You can read about it HERE. The other is Five Charm method, which Joey Yap introduced this year. This is for people who can't use the San Yuan Method of sitting and asking simply because they are not good at going to Alpha state. (You need to go down to Alpha state before doing the asking. Not sure what I am talking about? Refer to the blogpost HERE). This is how you use the Five Charm method. Now I am not sure if I get this part right. If you were there at the seminar, please correct me if I am wrong. 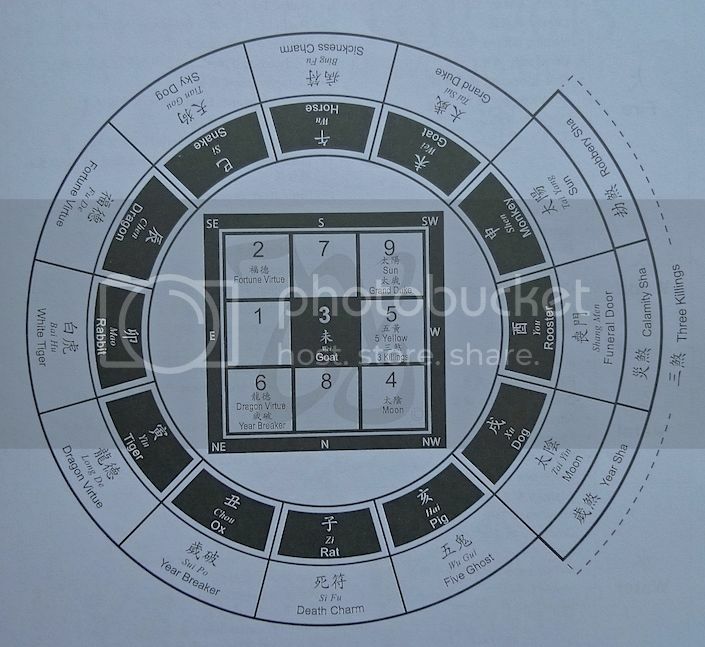 In your Personal Bazi Chart, you can see the Qi Men Mobility Directions. It looks something like this. Each direction has a General star. For example in the image above, West has Green Dragon, South has Moon, South West has Celestial Advisor and so on. Joey Yap said choose only 4 Generals namely Green Dragon (best), Celestial Advisor, Heavenly Noble and Moon. Green Dragon is supposed to remove all obstacles and possess invincibility. Unfortunately, Joey Yap did not elaborate on the other General stars. I suppose he is reserving them for his upcoming seminar. Partly that, and also partly because of lack of time to explain everything. Anyway, if you plan to use Green Dragon in the case above, then you need to travel in the West direction. For example, if you are going to an important meeting to close a deal, you need to make sure you are heading Westward to the meeting place. If the meeting place is not in the West direction, you need to go somewhere to the East of the meeting place, stay there overnight, before heading West the next day. In this way you are making use of the Green Dragon direction. Note : The direction of the General stars change every year. It is calculated based on your date of birth so you will have a new set of chart after your birthday each year. Now I know you have all been waiting for the Activation Dates and Times, but I am sorry to say that this post is getting a bit too long already! So I will have to defer that to Part 3. Stay tuned! 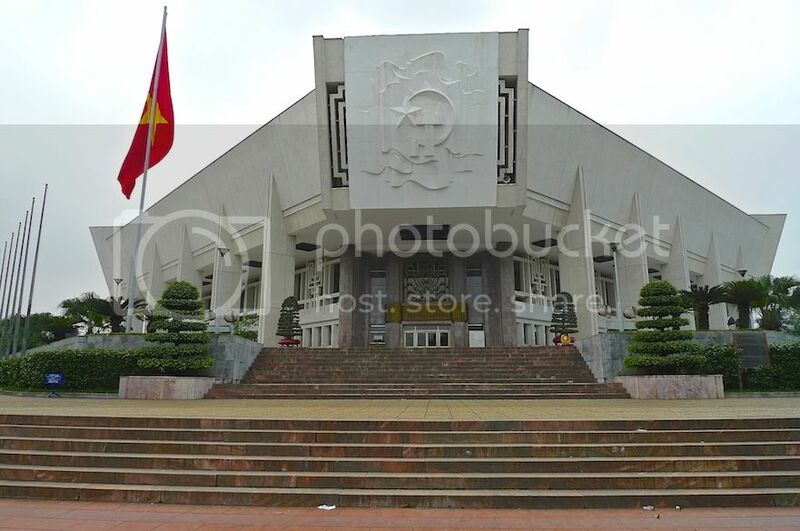 After visiting Ba Dinh Square and the Ho Chi Minh Mausoleum, my friend and I walked over to the Ho Chi Minh Museum (Bao Tang Ho Chi Minh) nearby. 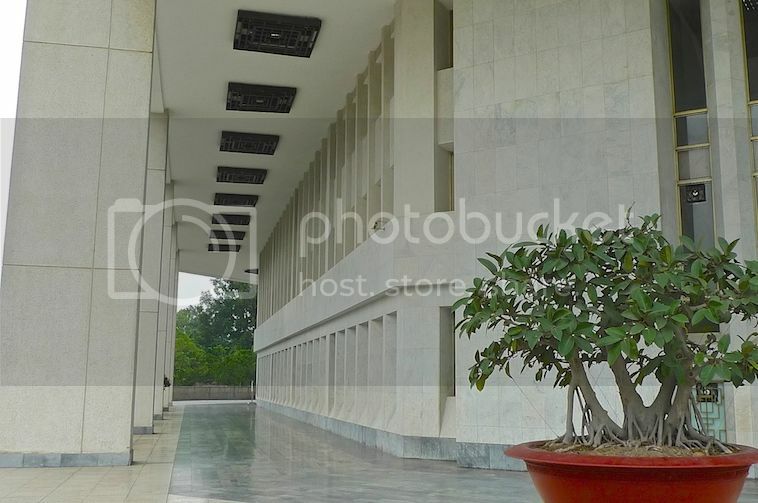 Just like the Mausoleum, the Ho Chi Minh Museum has influences of Soviet architecture. I was not particularly interested in spending my time inside a museum that day but my friend was, so I went in anyway. 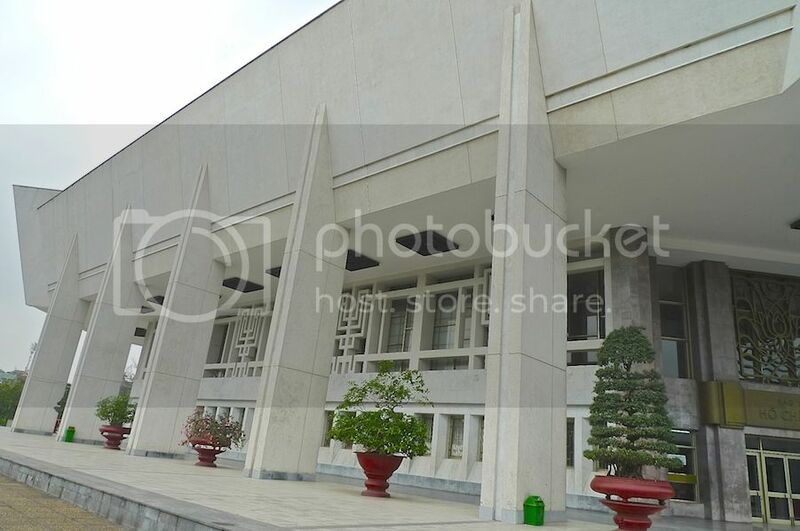 If my memory is correct, I think the entrance fee was 10,000 VND (US$0.45). I did not take any photos inside the museum as cameras were not allowed inside. So I am just going to show you the outside. 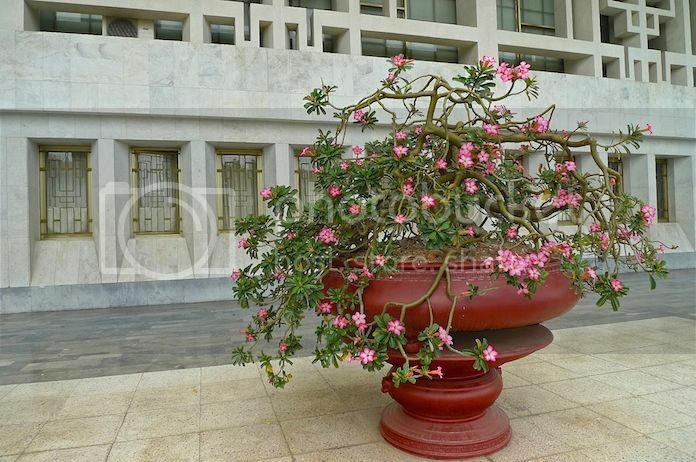 That's a nice desert rose plant! Now if only the desert rose in my garden has that many flowers! A lonely corridor outside the museum. We spent about one hour inside the museum. We could probably spent longer time but I had to hurry my friend as we have lots of other places to go after this. Besides, I did not find the museum that interesting. It's basically all about the life of Ho Chi Minh, the great revolutionary who became the President of North Vietnam. However, I have to say that the exhibition inside was surprisingly very modern and symbolic. I did not quite get the meaning of some of the displays. Perhaps getting a English-speaking guide would be helpful but we decided not to spend our money on that! After we left the Museum, we walked over to the One Pillar Pagoda (Chua Mot Chot) nearby. 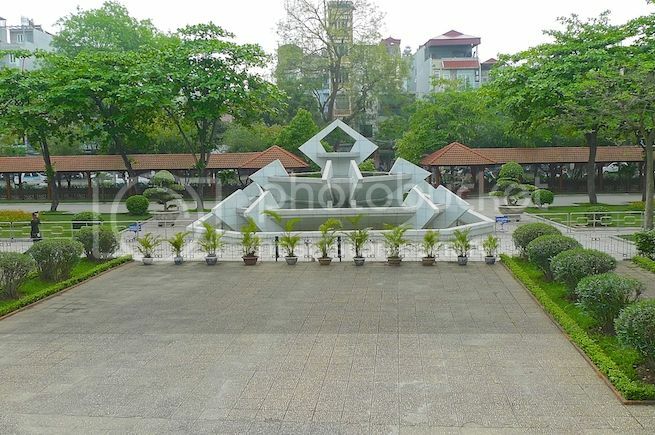 By now you would have noticed that the Ho Chi Minh Mausoleum, Presidential Palace, Ho Chi Minh Museum and the One Pillar Pagoda are all within walking distance to each other, so it makes sense to visit all of them at one go. 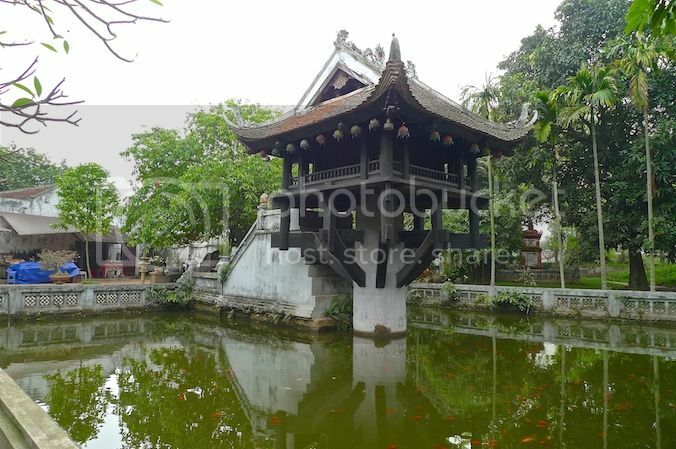 The One Pillar Pagoda is one of the most famous and iconic Buddhist temples in Hanoi. Originally built in the 11th century by Emperor Ly Thai Tong, it was however damaged by French troops in 1954. This newer version was built in the late 1950's. 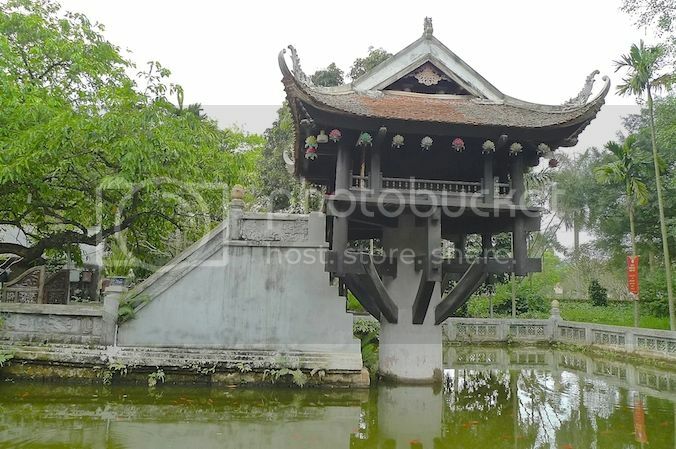 It was built of wood on a single stone pillar rising out of a lotus pond. From afar, it resembles a lotus blossom, a Buddhist symbol of purity. If you noticed, there is not a single human being in my photos here. That does mean that the places were deserted, it just means that I tried to take photos without anyone inside them. LOL! 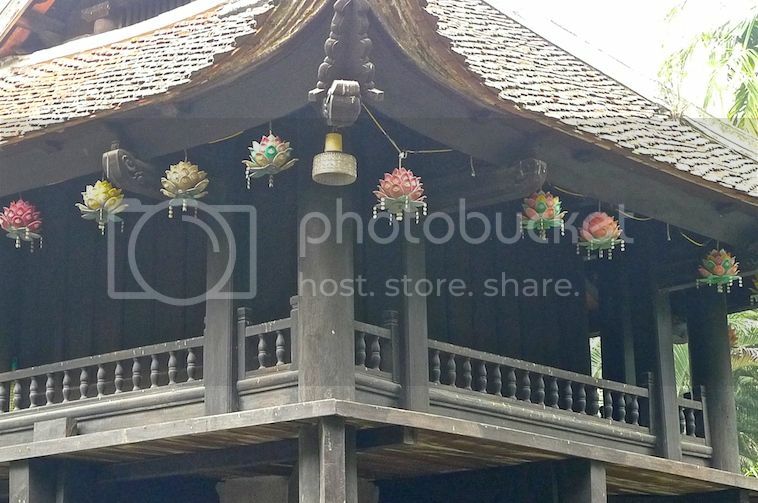 By the time we ended our visit at the One Pillar Pagoda, I could already hear my stomach rumbling. It was time for lunch! 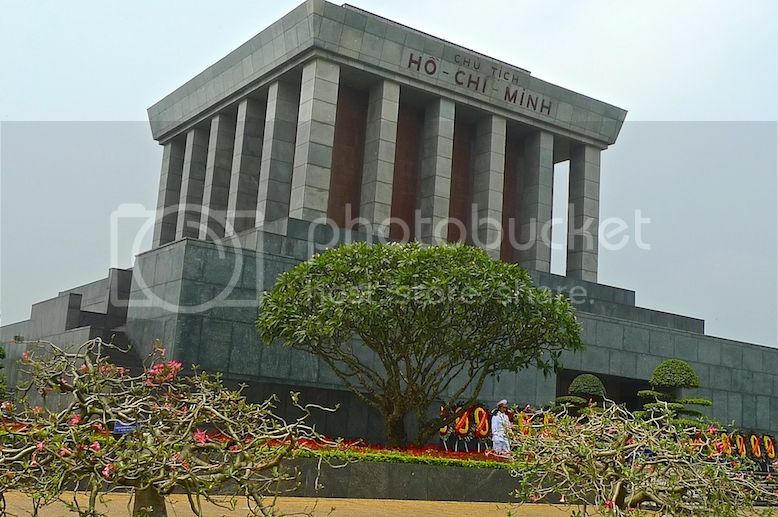 On my second day in Hanoi, my friend and I decided to visit Ba Dinh Square where the famous Ho Chi Minh Mausoleum is located. 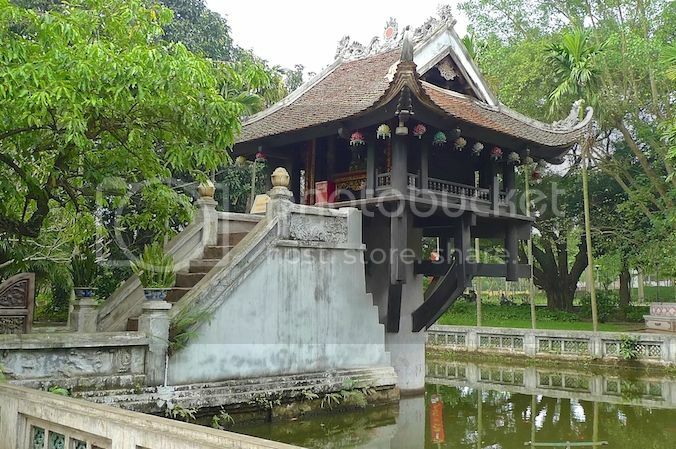 Earlier, we had taken a morning stroll around the picturesque Hoan Kiem Lake and visited the famous Ngoc Son Temple in the middle of the lake. 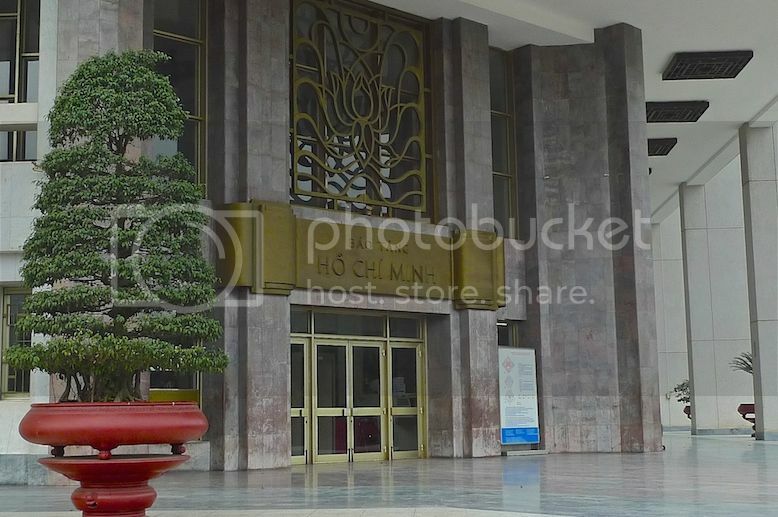 After buying tickets for the night's performance of the water puppet show at Thang Long Water Puppet Theatre, we dropped by the Tourist Information Center nearby. I did not find the Tourist Information Center very helpful. The map they provide was not good as there were far too many ads and lacked details. 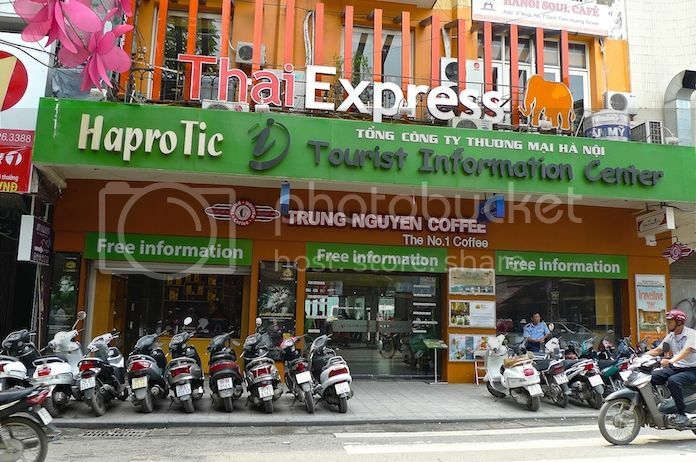 In fact, the staff at the hotel where I stayed were more helpful in providing me advice and tips on traveling in Hanoi. Oh, and that's Trung Nguyen Coffee - the No.1 coffee company in Vietnam. Surprisingly, I was not interested in trying the coffee! LOL. Maybe because I thought they were too commercialised and rather pricey. 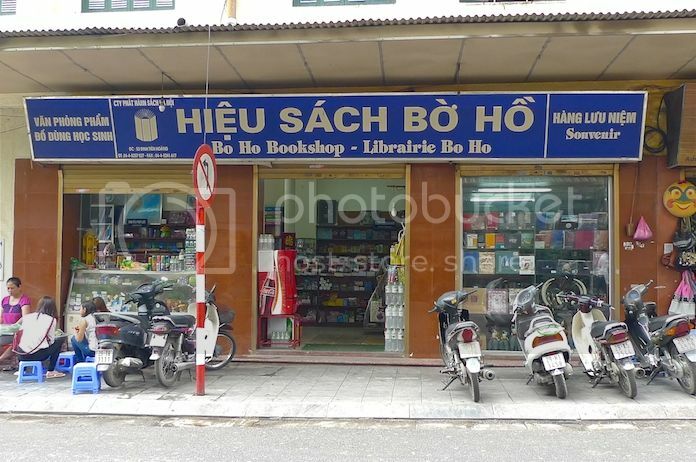 We found a bookstore nearby - it's called Bo Ho Bookshop. 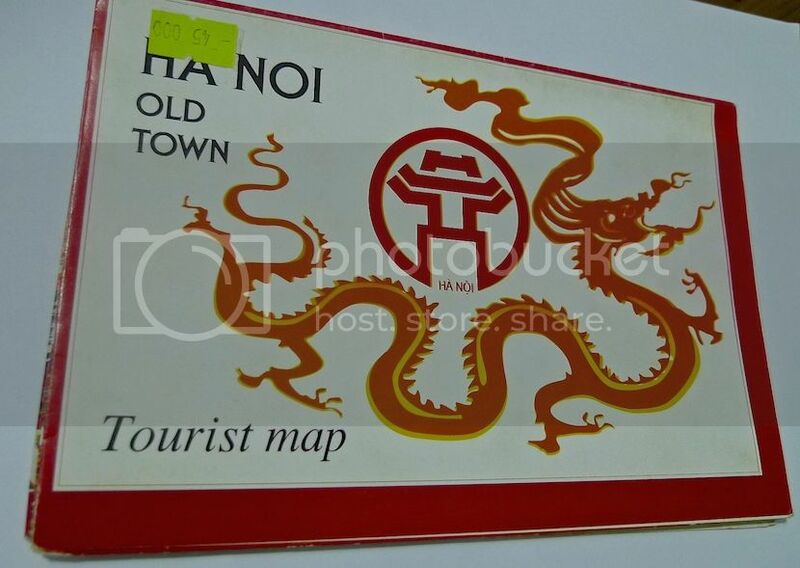 At this bookshop, I found and bought this Hanoi Old Town Tourist map selling at 45,000 VND (US$2.10). This is a very good map as it provides colourful drawings of buildings and streets of the Old Quarter in Hanoi. With this map, I'm pretty sure you will never get lost in the maze of the Old Quarter. My friend and I decided to walk all the way from Hoan Kiem Lake to Ba Dinh Square. We estimated that it would probably take us 45 minutes to an hour to reach there. Maybe we should have taken the taxi or cyclo (three wheel rickshaw) or even xe om (motorbike taxis) but I did not regret walking all the way there. Along the way, we stopped by a bakery shop at Phung Hung Street. 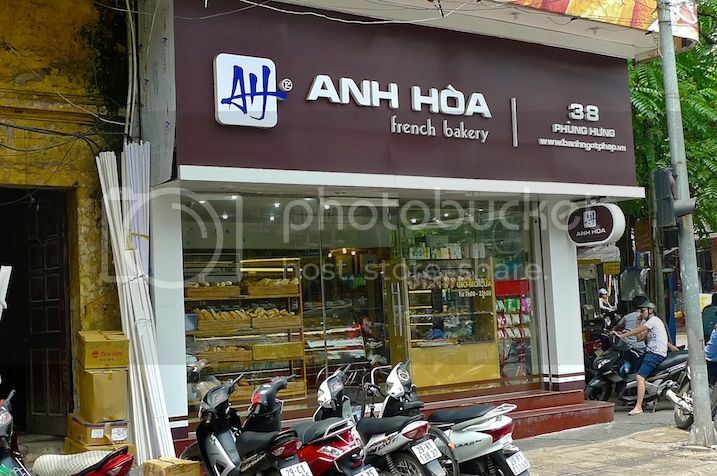 It's a French bakery shop by the name of Anh Hoa. We bought ourselves some French pastries and enjoyed eating them while we walked towards our destination. Soon, we reached Dien Bien Phu road. 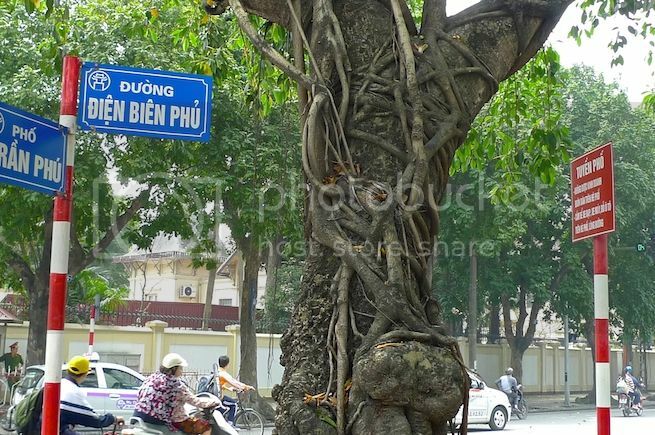 If this name sounds familiar, that's because you may have read about the Battle of Dien Bien Phu - the historical confrontation of the first Indochina War between the French and Viet Minh. More info HERE. We passed by Cot Co Ha Noi or The Flag Tower of Hanoi, which is part of the Hanoi Citadel, a World Heritage Site. 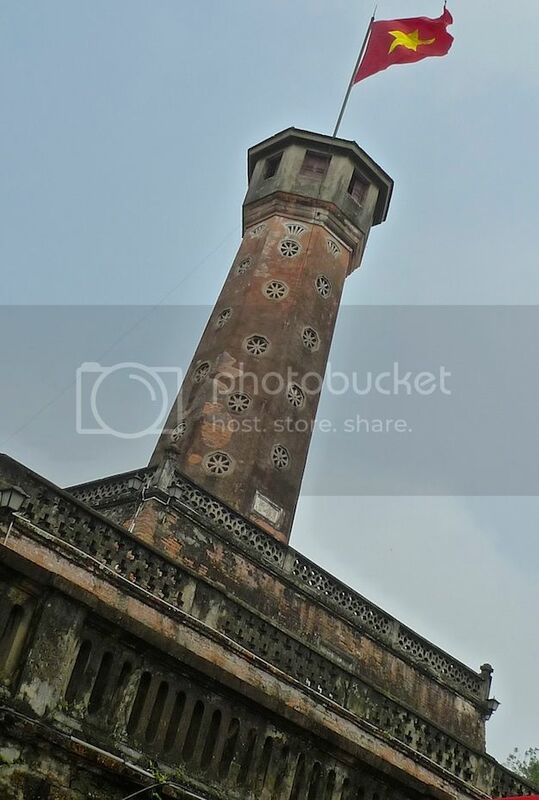 My friend and I did not visit the Hanoi Citadel and the Flag Tower during this trip, so maybe I will visit it on my next trip! 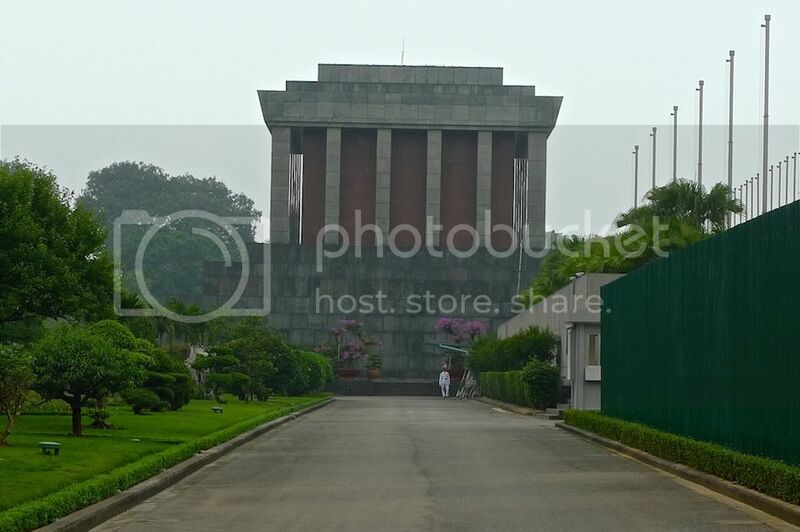 The Dien Bien Phu road leads to a roundabout and from there we could already see the huge Ho Chi Minh Mausoleum building. 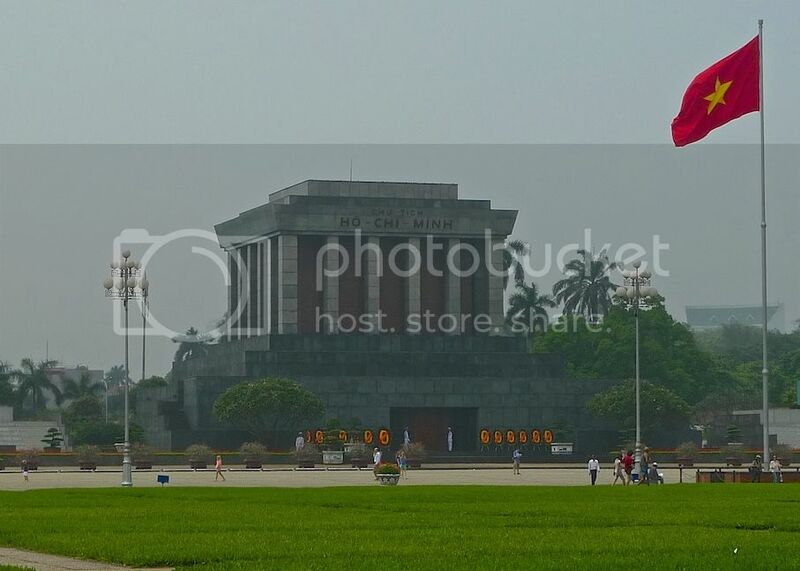 In front of the building is the Ba Dinh Square, a huge open space area of historical significance where President Ho Chi Minh read out the Declaration of Independence on September 2, 1945. Ba Dinh Square, with its grand Soviet-style architecture seems to contrast sharply with the chaotic Old Quarter where we came from just about 45 minutes ago. 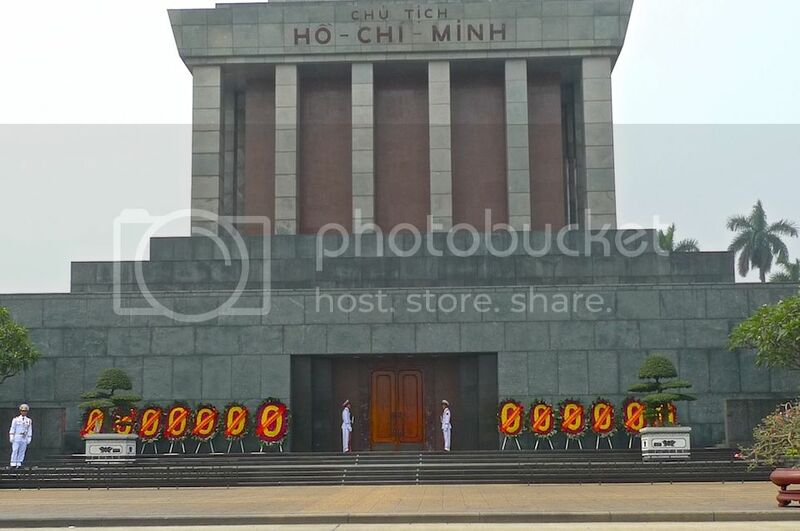 Inside this Ho Chi Minh Mausoleum lies the embalmed body of the President who died in 1969. I had no intention whatsoever to see the body but my friend was interested. Unfortunately for him, we were late and the Mausoleum was closed for the day. I am not quite sure of the opening hours for visitors as it depends on the time of the year, but I am pretty sure it closes on Mondays and Fridays. On other days, it only opens until 11am. But to be sure, it is better you check the latest opening hours before going there. I was told that you are not allowed to bring in your cameras and mobile phones, and you have to keep absolutely quiet inside. Also you are not allowed to cross your arms or put your hands in your pocket. That is pretty strict to me and frankly, I was a bit worried for my camera and mobile phone, so maybe that's why I was not really keen on entering the mausoleum. 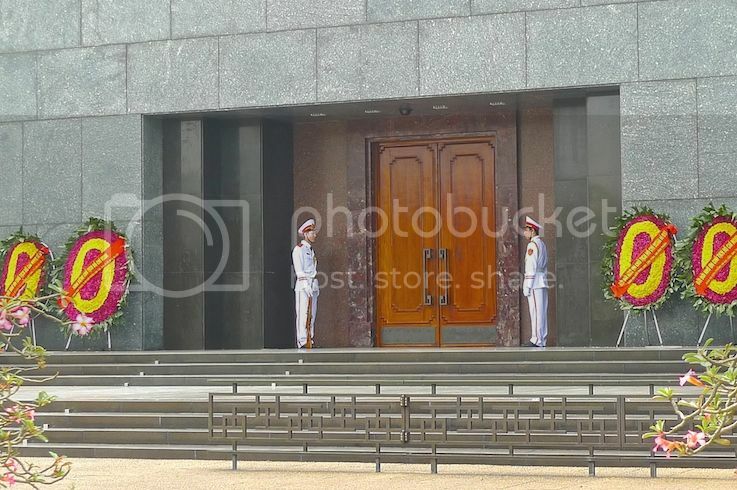 There were two guards dressed in white uniforms guarding the entrance to the mausoleum. 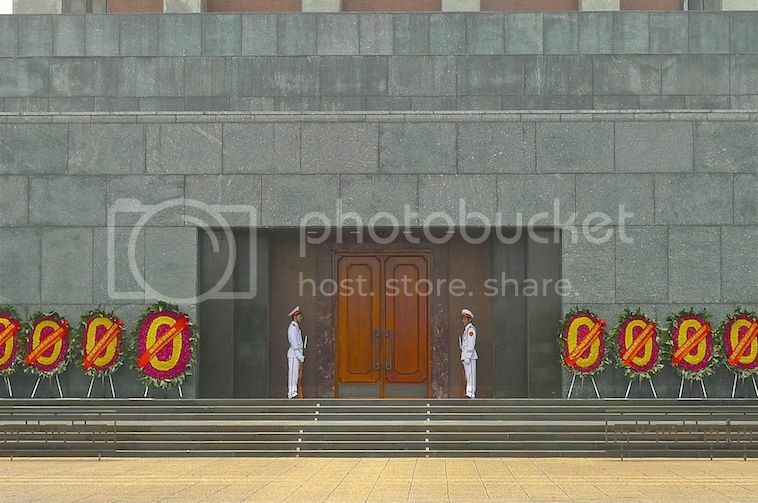 Did you know that the Ho Chi Minh Mausoleum was inspired by Lenin's mausoleum in Moscow? Despite that, it was actually ranked the sixth most ugly building in the world by CNN International! So did we walk all the way (about 3-4 km I think!) to see the sixth ugliest building in the world? Hahaha! 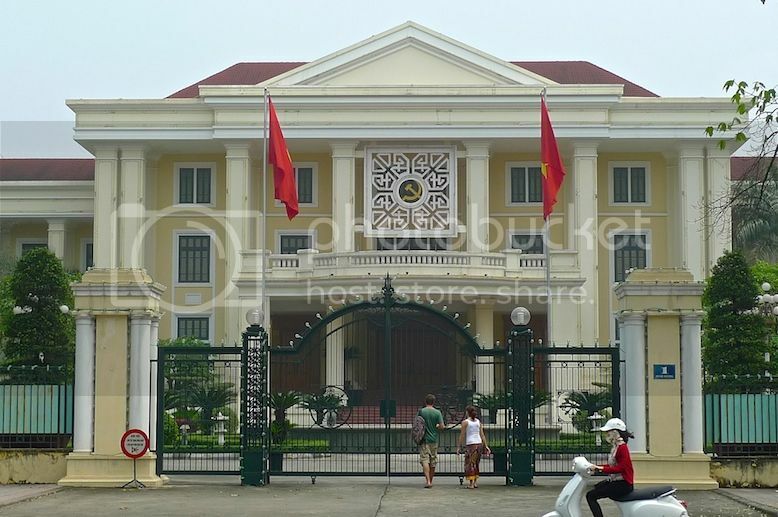 Nearby the Mausoleum and Ba Dinh Square is the Presidential Palace. 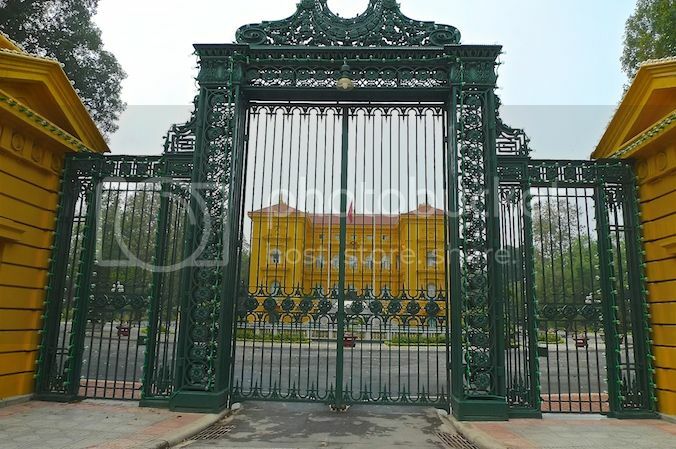 Visitors were not allowed in so my friend and I could only see the yellow-colored French-inspired building from outside its gate. 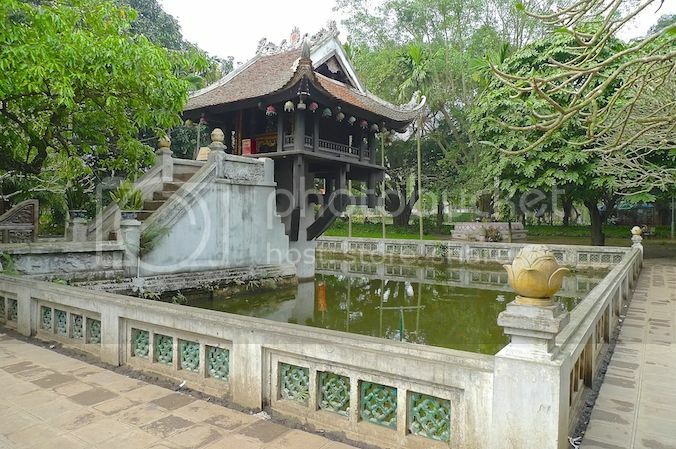 Did you know that Ho Chi Minh refused to stay inside this grand palace and instead, built a traditional Vietnamese stilt house near it? 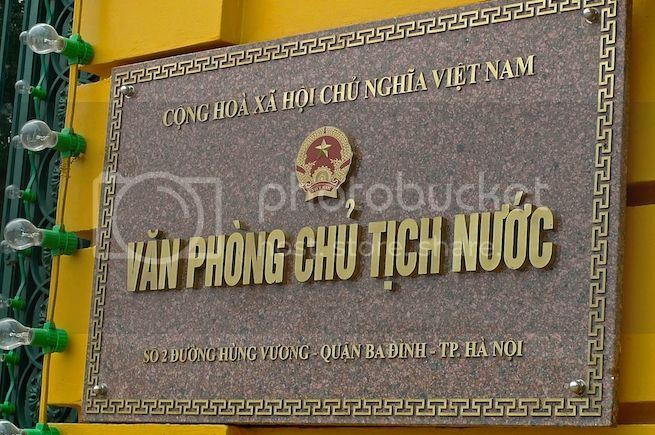 The name of the Presidential Palace in Vietnamese language on a huge signboard. Opposite the Presidential Palace is this building - I am not sure what building it is. Anyone reading this knows? 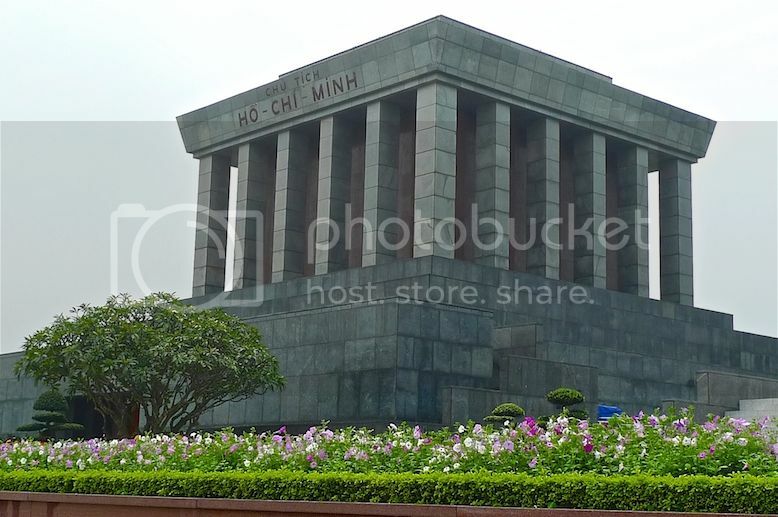 At the other end of the Ba Dinh Square is the Ho Chi Minh Museum and the famous One Pillar Pagoda which I shall blog about in the next post. 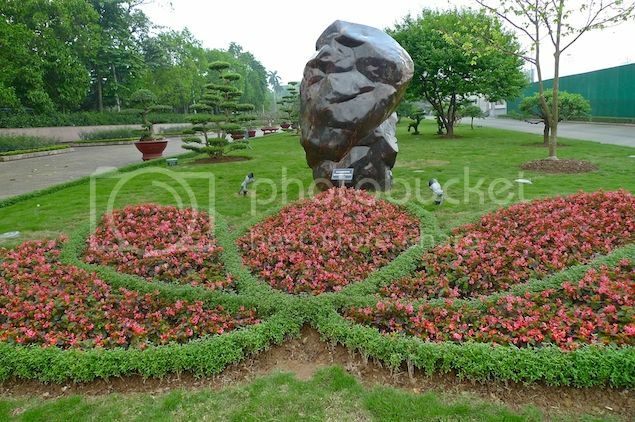 I had to take a picture of this beautiful garden behind the Ho Chi Minh Mausoleum. The Mausoleum as seen from the side. 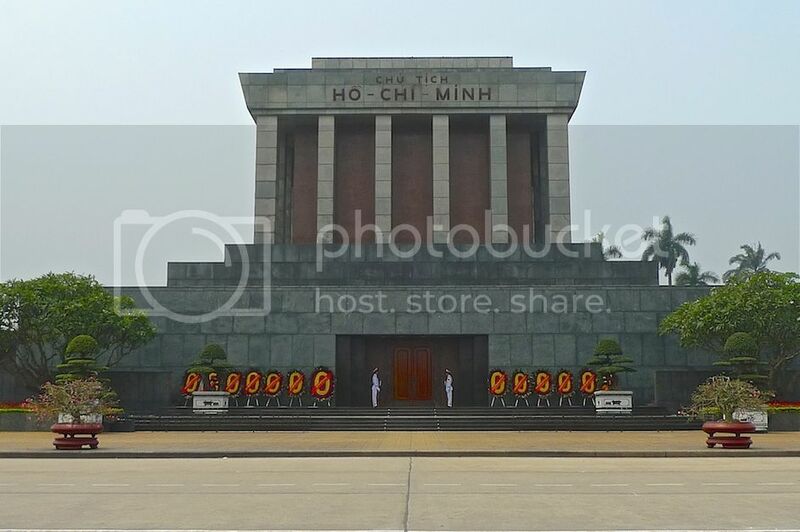 Perhaps during my next trip to Hanoi, I will enter the cold room inside this grand mausoleum where the embalmed body of Ho Chi Minh lies.